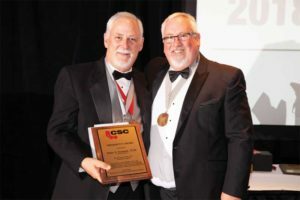 CSC executive director Nick Franjic, CAE, was also a President’s Award recipient. Sponsored again this year by Rockfon, the annual awards luncheon was emceed by Cam Newton, CTR. The event gave CSC a chance to celebrate its best and brightest members and associates. 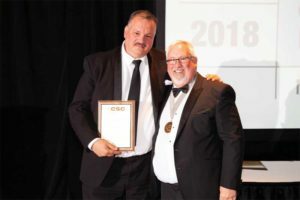 Peter Emmett was honoured with a President’s Award. Program Director Awards were given out in several categories. The Edmonton Chapter, with the help of Keith Robinson, FCSC, FCSI, RSW, and various sponsors, created the Stephanie Wertz Education Fund (SWEF) Bursary in the memory of Stephanie Wertz, who was passionate about specifications and a great friend to CSC. This cash award is presented to a deserving student in the architectural technology program at the Northern Alberta Institute of Technology (NAIT) and is being expanded to include the construction technology and interior design programs. The bursary, in the amount of $1500 per year, is awarded to a student who shows exemplary academic achievement and demonstrated financial need, and who has submitted an essay indicating his or her commitment to construction communication and documentation.